Report from the Turtle Protection team for the 2018 and 2019 laying season. This year our turtle team registered and obtained its license from the Ghana Wildlife Department. This means now that we are officially recognized, and can hope for support from the Wildlife Department for our efforts. I had a meeting when I was in Ghana with the Wildlife Department who promised to support our team. When I was staying at Meet Me There in December Debbie and I witnessed a beautiful mother leatherback laying her eggs on the beach opposite Meet Me There. I have added a couple of photos of this turtle. 75 hatchlings helped to the sea, the rest made their way on their own. 237 hatchlings helped to the sea, the rest made their way on their own. This year we had a great season. Leatherbacks reappeared in good numbers, and the wildlife department intervened to support us for the first time in many years. Their support made a considerable difference and saved the lives of many turtles. This year we came into contact with 93 turtles. This is so much better than the 57 turtles we encountered last year. From September to November we had our normal problem of half the turtles appearing on the beach to lay their eggs being killed. In early December the Ghanaian government declared war on all people who kill turtles. Our local wildlife officer, Karim, came to join the turtle team and cautioned everyone locally who is know to be killing turtles. He advised them that if they killed turtles again they would be prosecuted and face up to 10 years in prison. This had an immediate effect so that the death rates dropped dramatically. I will continue to work with Karim and the wildlife department to encourage them to continue their work locally. 1 protected (this is the first time this species of turtle has appeared on the coast). We protected and hid a number of nests, and relocated and protected several hundred eggs. We numbers of baby turtles hatch and we made sure these got into the sea. This year we found that some of the turtles that were dead seemed to have died from eating plastic. As you can see there are still numbers of turtles being killed and eaten by local people, despite efforts to educate them as to the consequences of this. The number of turtles found is now about half what it was 3+ years ago. While overall figures are much the same as last year, there has been a significant fall in the number of nesting leatherbacks. This may be because the Volta river has changed the direction of its release into the sea (as happens quite often) and so now it is pushing the heavier leatherbacks further down the coast. Some reports of killings in June and July. Lots of reports of sightings in August. As hatchings in September, clearly turtles laying in months before. 15 Olive Ridley turtles protected. 4 Olive Ridley turtles found killed. 3 Olive Ridley turtles protected. 2 Olive Ridley turtles found killed. 100 Olive Ridley hatchings escorted to the sea. 140 eggs laid and removed to safety. Numerous nests which the team erased signs of so that they were not disturbed. Big education and awareness gathering by Environmental Justice Foundation (Peter) to raise levels of awareness locally around turtle protection. 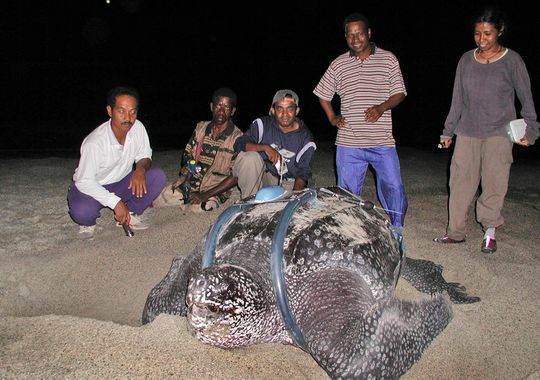 Despite this we are very sad to see so many Leatherbacks killed. The turtle team are feeling under great pressure from the local population who are suffering hardship from very low fish catches. They think this has been caused by illegal Chinese ships taking all fish from the sea just off the coast. 207 eggs recovered and moved to a safe hatching area. It appears that the mouth of the Volta river has changed direction and is creating a current that pushes the heavier leatherbacks further along the coast to Agitechi and to Anloga. We are getting reports of much higher numbers of leatherbacks coming out to nest along this stretch of the coast. There is no turtle protection team operating in that area and these leatherbacks are extremely vulnerable to being killed. 232 eggs recovered and moved to the safe hatching area. Substantial numbers of baby turtles hatched and taken to the sea. Here are the results for our Turtle Protection season that ran from October 2015 to March 2016 inclusive. 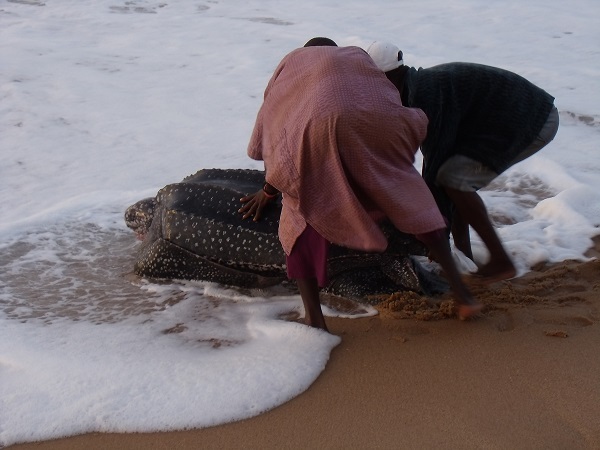 The turtle protection team patrols an area covering 10 km of beach close to the villages of Dzita and Dzita Agdbledomi in the Volta Region of Ghana where Meet Me There African Home lodge is located. The team was make up of one co-ordinator, two team leaders, and 7 turtle guards. The team patrols at night when the turtles emerge from the sea and climb onto the beach to lay their eggs. The team knows when the turtles will come ashore, times mostly dictated by the tides, and by the light of the moon. 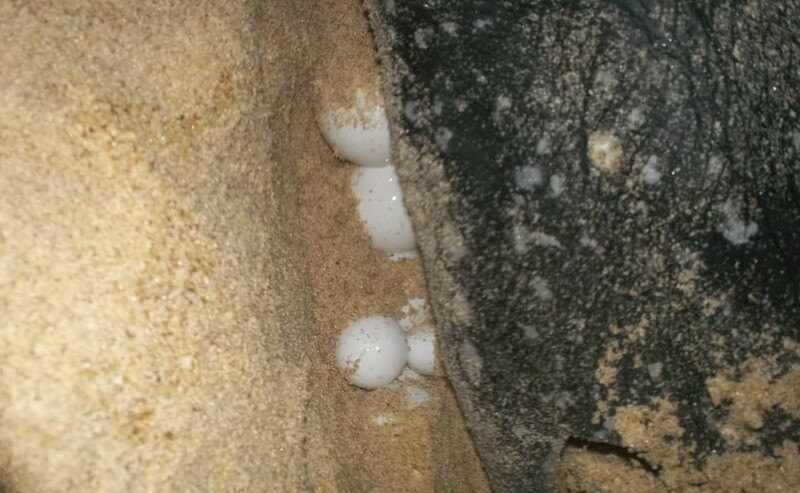 Once the turtles have laid their eggs the team ensure that they get safely back to the sea. They then dig up the eggs and carefully relocate them to a safe stretch of beach close to Meet Me There. If there are no local people around we cover all traces of the nest, and all turtle tracks and leave the eggs to hatch. If we move the eggs to the safe beach in front of Meet Me there we then keep an eye on the nests and make sure the newly hatched turtles reach the sea. Each turtle lays up to 150 eggs at a time. Leatherback turtles are critically endangered. The World Wildlife Fund reports that “the leatherback turtle has survived for more than a hundred million years, but is now facing extinction. Recent estimates of numbers show that this species is declining precipitously throughout its range”. I believe that this project can have a considerable impact on turtle numbers. For me if this species became extinct it would be an absolute tragedy for us all. Olive Ridley turtles are listed as vulnerable. The name for this sea turtle is tied to the colour of its shell—an olive green hue. They are the smallest of the sea turtles and currently the most abundant. Their vulnerable status comes from the fact that they nest in a very small number of places, and therefore any disturbance to even one nest beach could have huge repercussions on the entire population. On the beach we protect we know that large numbers of Olive Ridley are poached off the beach ( they are small enough to carry ) and taken alive to local markets where they are sold, killed and eaten. 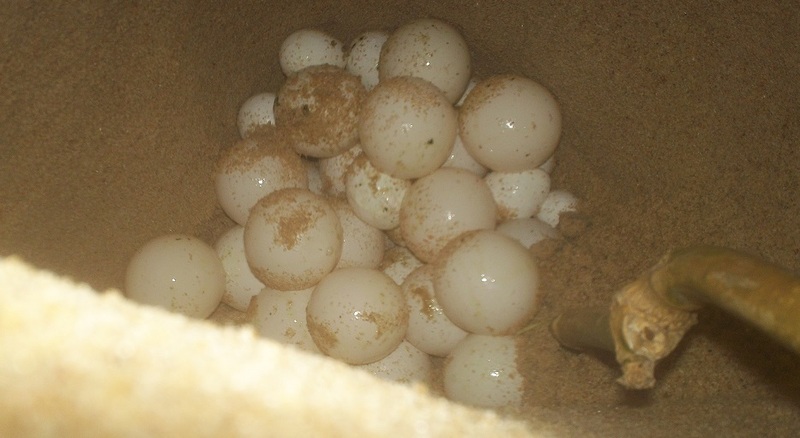 Since 2004 we have protected over 1000 nesting turtles, and have protected several thousand eggs. This effort is funded by the kind and generous support of a good friend. This has made a huge difference to us as now I can guarantee that I will be able to run the program without the very difficult scramble for funds that I have had to make in previous years. This has stabilised the program so that we can start the season confident and well prepared. The program provides well paid work for 10 local men who are very grateful for this work in an area where, apart from Meet Me There and Dream Big Ghana, there is no work. This year we had enough funds to work constructively with those in the local community who oppose our efforts. In the past a number of local men would poach the nesting turtles. They kill them and make turtle stew which they sell locally (this is totally illegal in Ghana, and if caught offenders face a 10 year prison sentence. Sadly the wildlife officers do not bother to enforce this ban). As you can imagine, they have not been happy with our efforts to protect these endangered animals. This year we have been able to pay a release fee to free any turtles that have been caught. We have also implemented a policy of visiting known poachers and buttering them up ( taking them out for a drink, etc ). We applied this policy from October onwards and it led to a steep decline in turtle killings. For the first time since we began protecting the turtles we have seen a significant decline in their numbers. In previous years we saw between 100 and 120 turtles a year. This year we recorded 56. Apart from the factors listed below we have little idea why this has happened. We are however seeing numbers of dead turtles which have died before they reach the beach. We think that these have become trapped in the nets of the illegal fishing vessels which pillage the fish along the coast of West Africa and cast overboard when the nets are pulled in. The pattern of turtle arrivals changed significantly this year. In the past they only started arriving in October. There may have been 1 or 2 in September. This year a large number arrived in September. Our protection team was not in action, and so these were mostly killed. We do not know the exact number. From now on we will start the protection season on the 1st September, and will not patrol in March as no turtles arrived in this month. Olive Ridley. Because these turtles are smaller than the leather back’s they can be carried off the beach. We are hearing of large numbers being taken live off the beach and sold in markets inland. 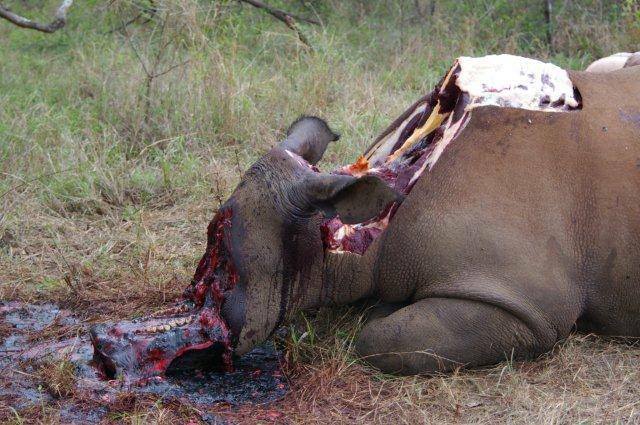 This must cause considerable suffering to these animals. We are finding that it is very difficult to prevent this. This year we protected even less Olive Ridley than in previous years. We only have the funds to patrol a 10km stretch of the beach, but know that all the turtles are still being killed on stretches of coast that we do not patrol. If we could patrol a further 20 km of the coast that lies adjacent to our current 10km section we could protect a lot more turtles. The turtle protection team have had a difficult first half of this laying season. We have no volunteers from ‘outside’ this year and their absence has made a significant difference as the local community seem to have taken this as a bit of a license to revert to their former practice of killing the turtles. The protection teams have encountered a certain level of hostility from people who want to kill and eat the animals. In the three months so far we have seen 63 turtles. We have managed to protect 48 of them, and sadly 15 were killed. We do have some great news this season. We have relocated 1023 eggs to a protected hatching site. Despite current losses this gives me some hope for the future. As you can see the leatherback is listed at number 4.
leave me full of sadness and feelings of despair. This brutality is matched by the treatment of the turtles we are trying to protect. Personally, I feel responsible for what is happening to these animals, and I feel it is my duty to try and do all I can to try and protect them. I will be trying to protect the animal kingdom for the rest of my life. For me it is not OK to sit to one side and watch this happen. I have a duty of care, not just to these animals, but to my grandchildren, and to yours, a duty not to leave their world utterly impoverished, destroyed by greed and ignorance. 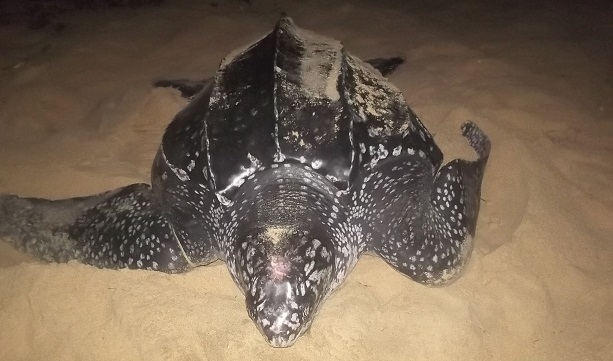 As you may know I run a project on the Eastern coast of Ghana which works to protect female leatherback turtles, olive ridley turtles, and green turtles which arrive on the coast to lay their eggs. Traditionally the community kill and eat both the turtles and their eggs. We have been spending the last 10 years working to change this practice to ensure the long term survival of leatherbacks and other turtles. The protection season runs from October to March inclusive. Please have a look at my report from last year’s season ( see previous blog). I am looking for volunteers to join the Turtle Protection Team and help them in their efforts. If you could join them from 1 to 3 months you could be a great help to the team. You will be going out at night with the turtle protection team to patrol and find and protect laying turtles. As well as this you will be responding to sighting where you will be called to a laying turtle so you can protect her and her eggs. You will ensure the turtle gets safely back to the sea, and you will be relocating the eggs so they can hatch in a safe area. A lot of this work is done at night, so you will need to be able to work at nights, and rest in the day. This is not always easy as all the other volunteers will be working in the day. No experience necessary, but if you have experience in this line of work that would be a huge bonus. This is the lodge you will be staying at. I am starting my annual Turtle Protection Program on the coast of Ghana. As with previous years, we will work to protect female turtles as they come ashore to lay their eggs. The team desperately need mobile phones ( so they can keep in touch with each other when patrolling, and so they can call for help, with a camera if possible ) and digital cameras with a memory card, so they can record turtle sightings, egg laying, etc. So , if you have a digital camera, ( with a memory card ), or phone you are not using, then please send them to us so we can use them to protect these beautiful animals. Please email me at hpnewton@hotmail.co.uk and I will email you the postal address. Without this protection these turtles will definitely be killed as they try to lay their eggs. As you can see below, despite this protection significant numbers of turtles were killed last year. We can only keep trying and educating, so that things will hopefully get better year on year. Many thanks one and all x Hugh Newton.